Colour is essentially the main element of painting primarily because it is something that painting does better than sculpture or drawing does. For this reason an appreciation of colour is essential to the painter. Whilst there are a small number of painters that do not use colour, some knowledge of colour is still beneficial to them, partly because the world upon which they base their work does appear in full colour, and partly because they will, in any case, need to position their work within the context of wider art history - a history in which painting has tended to appear in full colour. Working with colour entails an understanding of the nuances of colour, and how colours impact upon each other. See related articles for information on colour theory. For now we will look at an exercise that can enhance our appreciation of colour by limiting the range of colours we use. In limiting colour ranges it is possible to see what each colour does, by avoiding the use of white and black to lighten and darken the paint we also come of understanding of the tonal value of specific colours. Using just the primary colours on a white background pick a landscape scene, preferably one with lots of activity – you will need buildings, trees and other features to give you lots of tonal and textural variations to focus upon. 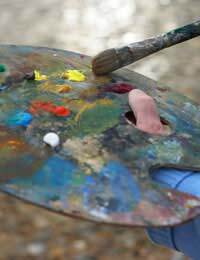 Arrange your primary colours (oil or acrylic paint) on your palette as far apart as possible and be sure to use separate brushes for each colour so that colours do not become mixed. Painting upon a primed white canvas or sheet of thick cartridge or Fabriano paper proceed to paint your scene using only your limited palette of red, blue and yellow. Although this may be difficult, you will find that some colours become immediately more appropriate to certain areas of your scene than others. Aim in this exercise to describe your scene as well as possible, and be sure not even to add white or black to alter tones. In so doing you will come to a better understanding of the three primary colours as they relate to each other both in their colour contrasts and in their tonal contrasts. From here you can experiment with other limited palettes, gradually developing an awareness of all of the colours as they relate to each other. Alternatively, you can use the primary colour palette, adding just one colour in order to see how that impacts on the three main colours. To see what can be achieved with a limited palette look to the artwork of the ‘Fauvists’, and early 20th Century group of painters who worked with bold and simplistic colour combinations. Prominent Fauves include Henri Matisse (1869-1954), Andre Derain (1880-1954) and Maurice de Vlaminck (1876-1958). Colour was central to fauvist painting, and was often used to describe form and tone in a way never before seen in Western painting. Their painting were often so bold that they earned the nickname ‘The Fauves (French for ‘The Wild Beasts’) from the French press.